In Contacts create custom labels for phone numbers, email addresses and some other fields. And once created, these custom labels are available to use for any other contacts. Here is a sample of custom labels created for Best Buy. I created labels for local cities. 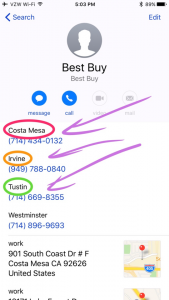 Here is how to create a custom label in a contact: tap Edit, and then tap on the blue label field. Then scroll to the section of the list where it says Add Custom Label. The label list cannot be sorted, however. Create labels such as His, Hers, Brother-in-law, Mother, Service, Emergency, Summer Home, etc. When calling this number, the iPhone will dial the number and stop and wait. When you hear the prompt to enter the extension number, tap the Dial “222” label and the iPhone will tone dial the local extension number. Here is how to enter a semicolon in a phone number in Contacts, on the telephone pad: press the +•# button and then select wait. Use this technique for entering, international phone card numbers, log-on codes, account numbers, and passwords. But be mindful of security when syncing on the iCloud.